Roaring back with their fourth album, Infernal Rock Eternal, in their tenth anniversary, is Chrome Division, alter ego adventure created by Dimmu Borgir vocalist Shagrath (Stian Tomt Thoresen). Once more the Chromesters whip up a batch of songs which blur the lines of hard rock and heavy metal with touches of groove, stoner, and southern tinged metal. At first listen, I wanted to say that his was album was not as good as the previous 3rd Round Knockout, simply because some songs didn't resonate with me. For instance, both Lady of Perpetual Sorrow and The Moonshine Years have touches of both southern and stoner metal, but seem weighed down by heaviness. Alternatively, when they get their groove going as in the latter third of The Moonshine Years, you hear typical Chrome Division. And that's when the band is at their best, getting their groove on, moving the heavy metal with the strength of classic rock and roll. Endless Nights gets this, as does the riff heavy No Bet For Free and the sometimes thumpy On The Run Again, tempered by a harmonious vocal line. Chrome Division can fall back to more charging heavy metal with the speed of Reaper on the Hunt, Mistress in Madness, and rush of Ol, which finishes the album. In one sense, Infernal Rock Eternal seems a mixed bag of musical direction, other times it's merely Chrome Division throwing you curves and keeping your interest. And that's to be expected. Recommended. 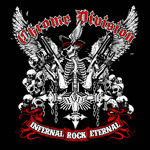 Chrome Division's Infernal Rock Eternal finds the band up to their old tricks, throwing you curves by blending hard rock with heavy, stoner, groove, and southern metal.